It’s that time of the year everyone; set review time! The decision-making folks decided to give the black cards to the person who plays the least amount of black for some random reason. Who knows? However, here we are doing the things that need doin’. I won’t be covering the Saga cards here today, as we have a completely different article for those, so keep an eye out! On that note, let’s get rolling! Go for the Throat is played in over 10,000 decks according to EDHREC, so we know that conditional single target removal is in high demand. The same goes for Doom Blade, Hero’s Downfall, and so on. This can’t hit your friends’ commanders, which is a fair downside, but we know people play cards like this, so expect to see it. This is is an instant speed Bitter Revelation that digs one card less. But then, Bitter Revelation is played in fewer than 500 decks according to EDHREC, so it’s probably not going to be terribly relevant. Regardless, decks that want to put cards in the graveyard and hand might welcome an instant speed upgrade. I like the card but don’t see it being played a great deal. 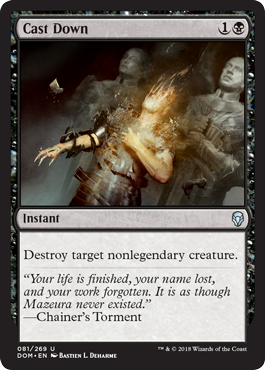 Auras in black aren’t very popular, but one that brings back your commander or huge beater softens the blow quite a bit. 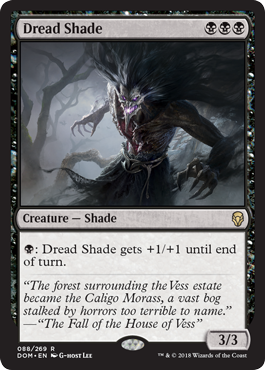 Mono-black aggressive decks might be open to playing this, but it’s another corner case card. 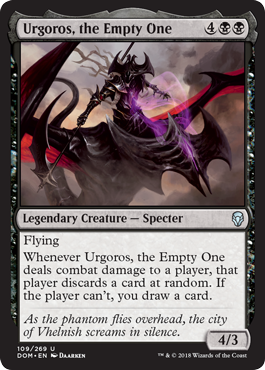 If you’re a Vorthos nerd who cares about “story” and “flavor”, then this card is a homerun. 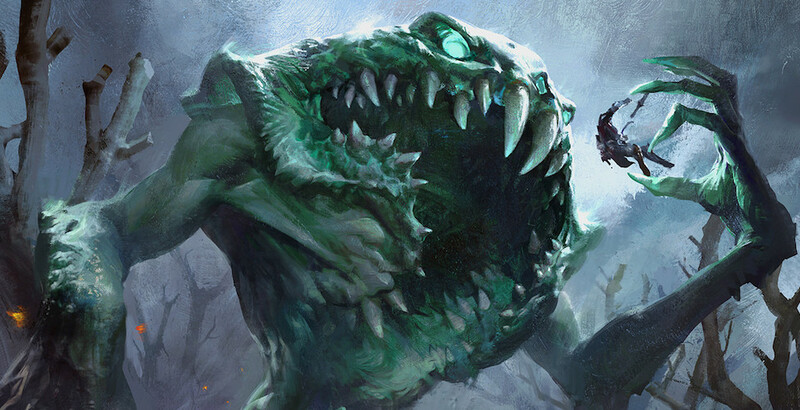 At 6 mana it’s a bit expensive to have at the head of your deck if you plan on casting it more than once, but legendary demons have a tendency to do big things in the format. This might be the closest thing to the banned Griselbrand we get. Lots of potential to fill your hand if you build your deck right. This card is very powerful and will bring all the boys to the yard. Nantuko Shade’s bigger and badder brother, sister, ummm…thing. 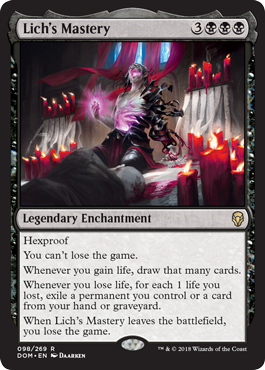 The shade-type effects don’t get a lot of love in Commander, but black devotion decks will appreciate the triple-black pips. Flavor text aside, this card is great. Include the flavor text and it’s pretty badass. 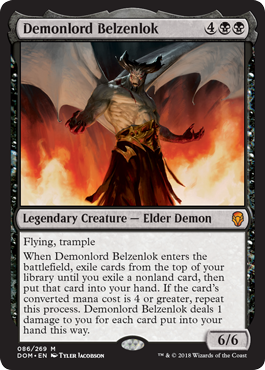 Diabolic Tutor is played in over 32,000 decks on the site, and there are a great number of black decks that care about Entomb-effects as well. If your deck can take advantage of using the graveyard as an extension of your seven-card hand, like the new Muldrotha, the Gravetide, then this card is essentially a double-tutor for a single extra mana. 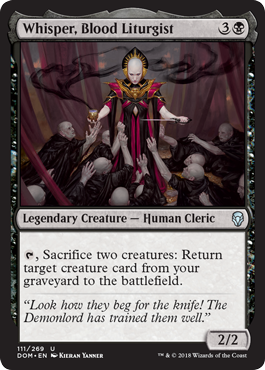 I love this card and will definitely be putting a few into my budget decks like Glissa, the Traitor. A 4/5 for 4 mana with some evasion is already pretty aggressive. If you’re able to take advantage of the kicker cost stapled here then you get a whole army for a single card. Ten is a lot of mana, but this might be worth the payoff. If you are playing Cabal Coffers and Urborg, Tomb of Yawgmoth then it’s probably easy peasy. 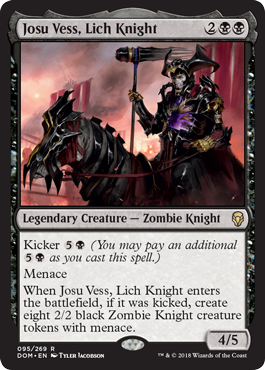 I really like this card, since it does a whole heck of a lot and can be played as a mono-black zombie commander or easily as part of a 99. Expect to see this handsome devil in a fair amount of decks. Is this in the gold card review or the black card review? Maybe both, who cares? I like it so if you get an extra point of view then…darn. Free value never hurt anyone. Anyways, 7-mana is quite a bit to invest into a card, but this bloodsucker can get bloody big bloody fast. From a potential standpoint, this card is purely a beater waiting to happen. 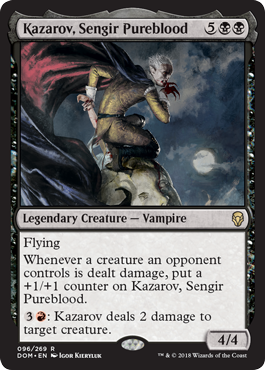 I doubt Kazarov gets too popular, but if your Edgar Markov decks want any more curve toppers then you could do worse than this guy. I love the flavor and throwback to Lich here. If this didn’t topple instantly to an overloaded Cyclonic Rift then I bet it would be much more popular. If you play with people who are original in their deck building and don’t play mass bounce, then this card could be very easily abused if you have enough ways to gain life. It’s a bit fragile, but if you like living on the edge, you might be interested in mastering this type of challenge. 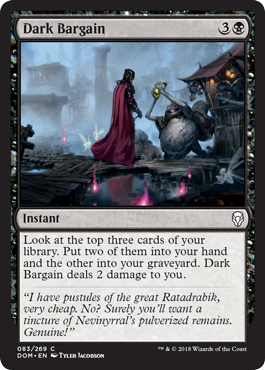 If your name is Patrick Sippola and write for EDHREC, this card rustles so many of your jimmies. If not, this is just a more different Relentless Rats for you. 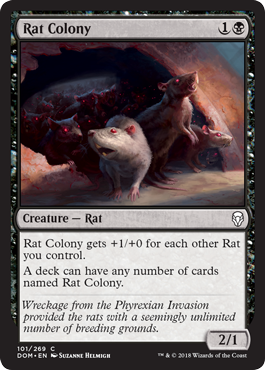 These types of cards don’t excite me a great deal, but I know there are plenty of casual rat decks out there that will welcome these rabid little dudes. Superfriends-type decks probably don’t need more single-target removal, but then I’ve never played a superfriends deck so what do I know? 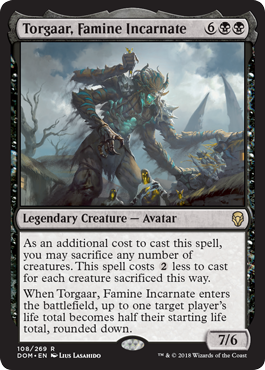 Speeding up a planeswalker ultimate isn’t anything to sneeze at, so I’m probably wrong in thinking this isn’t that great of a card for Commander. Normally I wouldn’t care that much about this type of card, but since Slimefoot, the Stowaway has everyone in a tizzy regardless of what types of decks they normally play it seems worth mentioning. There will be fungus among us indeed. 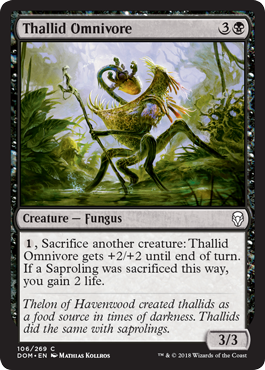 A 7/6 that can dome somebody for 20+ life is big game, especially when you consider you can sacrifice your own critters to pay for the commander tax to keep at it. If you can find a way to flicker/copy/abuse in general this ability you can make some games much shorter than they usually would be. Keep in mind that it says ‘starting life total’ so if you try and do this against the same opponent, they’ll actually gain life! How do we turn this frown upside-down? Why using anti-lifegain tech like Tainted Remedy or False Cure…then they lose any life they would gain instead. That’s much, much better. I’m a fan to say the least. This isn’t even the best specter out there. If you want to play specter tribal I guess you like this. For six mana though…bleh. I really wanted to like Whisper. I still do, but not as much. When I realized Whisper is just a Hell’s Caretaker only different it went down a bit on how much I wanted to build this deck. 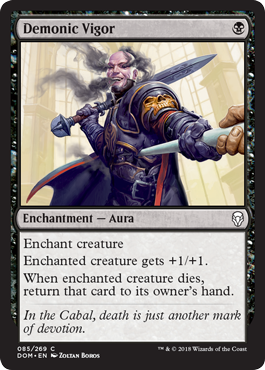 There are enough sacrifice/reanimation-type effects out there that I’m just not convinced that this is the best rate out there. Victimize probably is better even. I’m torn. Yes and no. Thanks and no thanks. 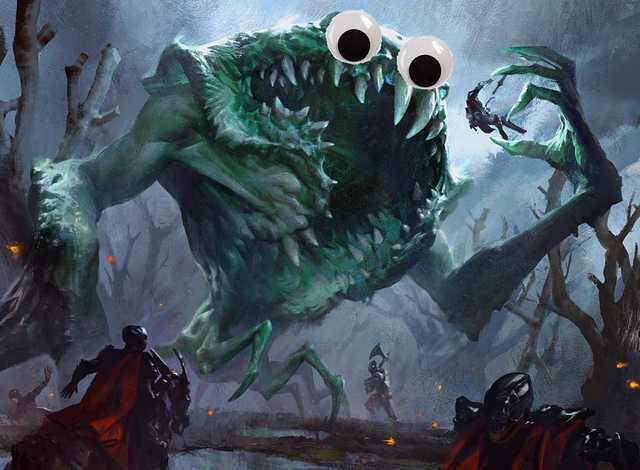 Yargle is just the most fun word to say in the set. Plus this is a frog spirit. Guys, seriously. Frog. Spirit. WT-frick? 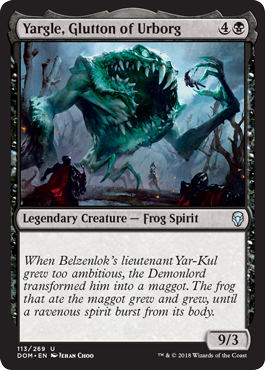 Also, I would be remiss to talk about Yargle without sharing this photo that was shared with me…. No, you can’t reanimate your Protean Hulk with this and then destroy that same Protean Hulk at the same time. That’s not how these things work. Being able to steal someone else’s Protean Hulk from their graveyard and then kill your own Protean Hulk that you already had out is possible, but at that point why are you even playing that game? It sounds miserable and you need to play less boring decks. And there you have it folks! The dark side of Dominaria, delved into by someone with dubious views on black to start. What do you think of the necromantic offerings from the set?